Invasive ductal carcinoma represents the most common form of breast cancer and is found in about 80 percent of all breast cancer cases. Despite significant improvements in breast cancer management and diagnosis, early detection of breast cancer plays an essential role in the overall treatment. Preclinical studies of the BT474 mouse xenograft model can be used to evaluate anti-cancer therapies. Well-studied breast tumor cell lines are indispensable tools for investigating cell biology of carcinomas. Breast cancer cell lines are extensively employed in preclinical research as molecular models of different types of breast tumors. The BT474 tumorigenic epithelial cell line is isolated by E. Lasfargues and W.G. Coutinho from a solid, invasive ductal carcinoma of the human breast of a 60-year-old Caucasian female patient. The BT474 cell line is aneuploid with a modal chromosome number of 55, as indicated in a 1978 article in Journal of the National Cancer Institute. The BT474 cell line is used to create the CDX (Cell Line Derived Xenograft) BT474 xenograft mouse model. 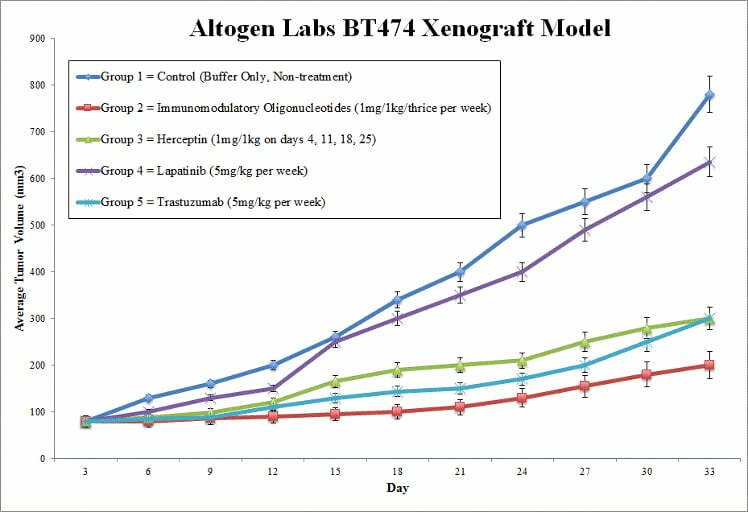 The BT474 breast cancer model can be used to screen anti-cancer therapeutics related to the standard of care drugs (herceptin, lapatinib, trastuzumab) or hormone-induced disease progression (progesterone, norgestrel, norethindrone and MPA). Examples include the 2015 OncoImmunology study (Zhang et al.) that used the BT474 model to investigate acquired resistance against trastuzumab and develop novel human epidermal growth factor 2 (HER2) antibodies. Their data suggested that blocking the HER2 protein could trigger calreticulin exposure and subsequently cause tumor specific T cell immunity which decreases tumor recurrence. A 1995 study (Slooten et al.) established BT474 as a powerful model for hormone-dependent breast cancer and immune therapy as these cells are oestrogen receptor positive and overexpress c-ErbB-2 protein (more commonly known now as HER2) with the in vivo phenotype of poorly differentiated adenocarcinoma that have high proliferative and turnover rate. BT474 cells for injection are maintained under aseptic conditions of exponential growth prior to injection. Cells are trypsinized and cell count viability is determined using a trypan blue exclusion assay (98% of cell viability is required). BT474 cell suspension is adjusted to appropriate density. Each mouse (NCr-nu/nu mice, 12 w.o.) receive a single subcutaneous injection into the right flank area containing one million cells in a volume of 100 microliters of a Matrigel-BT474 cell suspension. The injection sites are palpated up to three times weekly until tumors are established. Tumors are then measured via digital calipers until an average size of 50-150 mm3is established. Animals are then randomized into appropriate treatment cohorts and administration of test compound is performed according to the established treatment schedule. Mouse weights are recorded 3 times weekly and tumors are measured daily. Final necropsy and tissue collections are performed as defined for termination of experiment. Gross necropsies are performed and tissues are collected for downstream analysis. Tumors and tissues can be stabilized in RNAlater, snap frozen in LN2or prepared for histology. Xenograft animal models are used to assess the effectiveness of experimental test compound against specific types of cancer. New medicines are tested on staged tumor growths that have been engrafted via subcutaneous or orthotopic inoculation in an immunocompromised mouse or rat model. All clinically approved anti-cancer agents have been evaluated with conventional preclinical in vivo models. Xenograft studies can be highly complex, starting with the selection of the appropriate animal model, choice of tumorigenic cell line, administration method, dosing, analysis of tumor growth rates and tumor analysis (histology, mRNA and protein expression levels).